Mary E. Reczek of Peabody and formerly of Winthrop passed away at the Brooksby Village in Peabody on March 23, 2019. She was 95 years old. Born in East Boston she was the beloved daughter of the late Mary (Hayes) and William Fielding, Sr.. She was a former member of the Winthrop Catholic Women's Club. 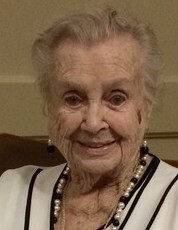 She was the devoted wife of the late Walter A. Reczek, Sr. and the loving mother of Paul Reczek and his wife Ruth of Kingston, New Hampshire, Robert Reczek and his wife Lorraine of Melrose, Gerard Reczek and his wife Gail of Andover and the late Walter A. Reczek, Jr. and his wife Mary Ann of Lexington. Dear sister of the late William Fielding Jr. and James Fielding. Also survived by 12 grandchildren and 19 great grandchildren. Family and friends are cordially invited to attend the visitation from the funeral home on Wednesday, April 3, 2019 from 9:00 to 11:00 AM followed by a funeral mass in St. John the Evangelist Church 320 Winthrop St., Winthrop at 11:30 AM. Services will conclude with the committal in the Cross Street section of Winthrop Cemetery. Memorial donations may be made to the Joslin Diabetes Center at www.joslin.org.